So my left fender is all dented up and scratched up from a fender bender the previous owner go into. what steps should i start taking towards repairing it? Last edited by Mu5ic92; 02-25-2011 at 02:03 AM. 2, Have the same Honda shop paint the fender in the correct color. 3, Replace the fender myself. The price in EU for a new fender is currently 265 Euro + taxes and paint of course. man thats expensive for a fender but then again i havent really shopped around. I know for a fact that a lot of people buy their fenders off of ebay. I havent done any looking around on how legit they are, but I know a lot of people trust ebay for their fenders. That being said start calling body shops around you and pricing paint for that fender. And then do the install youself. Its fairly straight forward and there should be a few diys somewhere around here to do it. Lol thanks man. ima search around. i have sorta a distant relative who owns a body shop so ima get a estimate from him and then ask him how much it would cost to just paint the fender with me installing it and everything.btw the black plastic that goes under the fender does that usually come with buying a new fender? No, the plastic needs to be bought separately, I paid ~115 USD for a new one from Honda. If you have any salvage yars around you might want to check to see if they have any. May save you a bit of $$$ if you luck out. You may get one the same color. You may find a nice one that is a different color that you have to sand down, but it may be a bit cheaper than a new one. I bought a mirror for a Buick years back, happened to find the same color in a salvage yard and just threw it on. Looked fine, color matched up perfectly. i got my jdm fenders off ebay. of course they were used, and the paint was horrible, but i repainted them myself anyway. taking it off/putting it on is fairly straightforward as well. you will have to remove the bumper of course. ive seen oem fenders go for quite cheap on ebay. since youre going to have it professionally redone, it wouldnt really matter if it had a slight dent. a pint of red for my car is like, $42. idk what color you have, it will vary. labor is usually around $90 an hour, you MIGHT get away without having to pay for clearcoat. i actually found this sticker on the side of my door by where the tire info is. im hoping this will help with getting the fenders paint to match with the rest of the car? Last edited by Mu5ic92; 02-26-2011 at 01:47 AM. 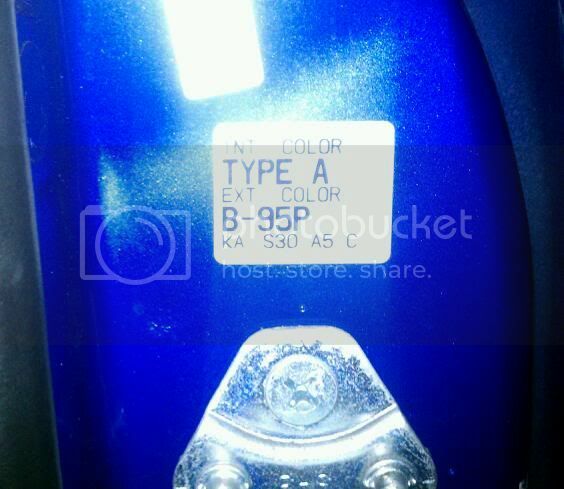 Yes, the color is B-95P as it say on the sticker (Electron Blue Pearl), the painter will still need to be decently skilled to match the color to the rest of your car though, as the fender needs to be painted in several layers (paint & clear coat). what range of price are we talking to get the OE Fender and get it painted B-95P with shipping ofcourse unless you happen to be in florida. lazer kept saying he was buying stuff from honda ..that's the highest price place to go. by the time you get your old fender off you should be pretty secure in how to put it back on..keep up with what bolts came from where, especially the bumper stuff. I know my driver side fender is OEM from a fender bender like you. I think it's ebay and is great quality and color matched perfect.